The movie was hard to watch. I remember watching Glen Campbell when I was younger. The movie shows Cambell going to the dr and then following him doing shows and how Alzheimer’s disease is effecting him and his family. It is a great drama that shows the great bond between him and his wife Kim and how much they trully care for each other I'll Be Me shows just how much they would not give up against all odds. It is a wonderful and touching movie! I dont really know him but i will be hecking him out! I like Rhinestone Cowboy. Thanks for the awesome giveaway. 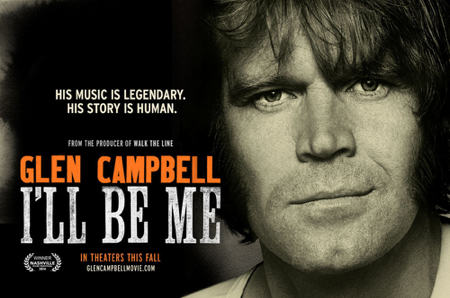 We love Glen Campbell and love all his songs but if we have to choose which is our favorite Glen Campbell song it would have to be Wichita Lineman. I like "Rhinestone Cowboy" and "Ghost on the Canvas." kristiedonelson(at)gmail(dot)com Thank you. I'm Not Gonna Miss You is the saddest but best song if you listen to the words.